Today we will talk about a rather delicate subject, that of decorating cemetery chapels. Old family tombs are a very rich heritage, made of real artistic treasures that recount the history of our ancestors. We have always felt the need to bring together under one roof our deceased relatives, and these places become a spiritual encounter between us and those who are no longer with us. This intimate and private place can be made more pleasant by decorating it with a fresco created in a professional and serious manner by the Mariani Company. “Our authentic frescoes,” explains Alberto Mariani, “made using age-old techniques are extremely resistant and can stay outdoors for a long time, which makes them perfect for decorating these types of places”. 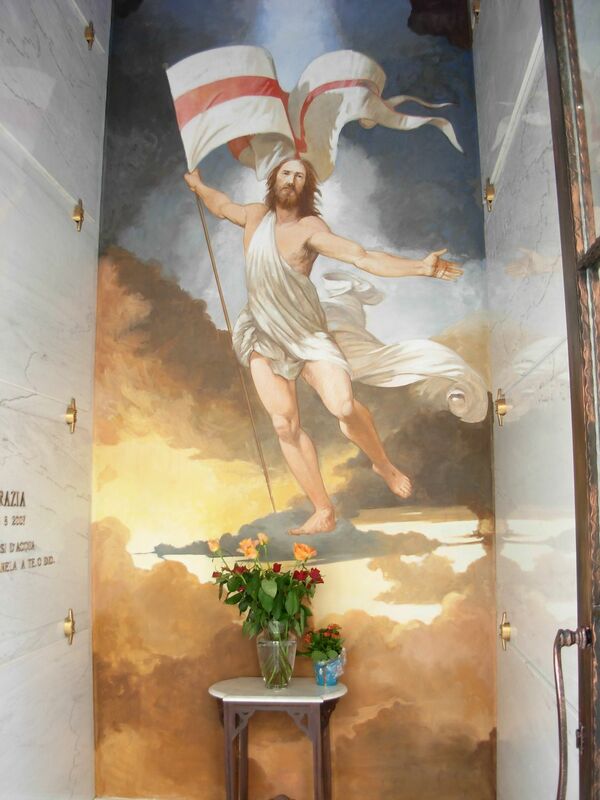 What goes into making a fresco for decorating cemetery chapels? 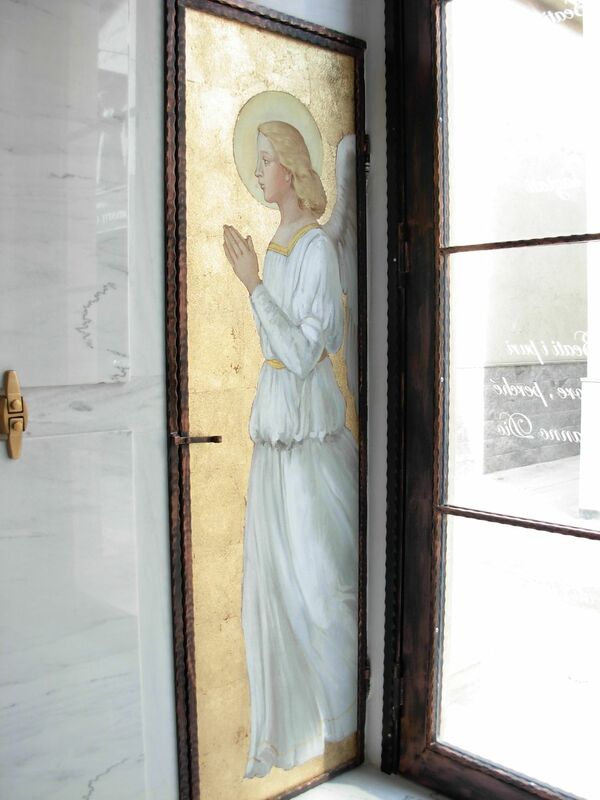 Mariani Affreschi sends the painters directly to the cemetery and they work on site or produce the frescoes in our laboratory and then install them at the site. The subjects usually chosen for these types of places are religious and, depending on each person’s personal beliefs, specific scenes can be depicted. For example, the fresco depicting the “Resurrection of Christ” (shown in the photo) was painted for a family cemetery chapel near Reggio Calabria. 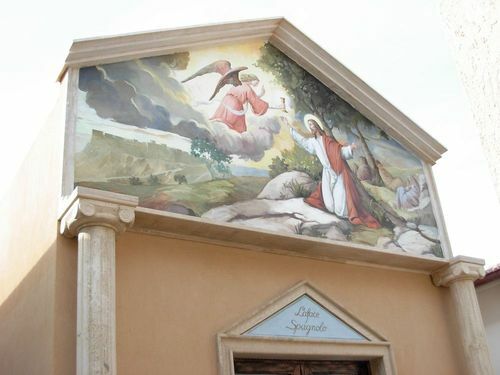 It was painted directly on site by Mariani’s artists, i.e. by preparing the fresh plaster base and then painting the scene according to the ancient fresco technique. Alternatively, as required, the work can be prepared in our Brescian laboratory and then sent to the location to be installed in any niche or on any wall. These are some examples of the many works created by the Mariani company for its customers. dovrei decorare con immagine di cristo uno spazio utile murale, già con cornice in gesso , di cm 80 di altezza e cm 120 di lunghezza, nella cappella gentilizia del cimitero. potreste mandarmi delle raffigurazione da valutare per poi decidere su una da acquistare?